Vote in Our Board of Directors – November 18th! Our Annual General Meeting is coming up this Wednesday, November 18th from 6-8pm and we need you to vote in our new Board of Directors! Check out their applications below to learn more about this year`s applicants! Here is the 2015 AGM Agenda as well as the 2014-2015 Annual Report. You can view the 2014 AGM Minutes here. You can view our Greenhouse Constitution here. I am currently in my third year as an undergraduate with a major in Urban Planning and a minor in Sustainability. I have been interning for the greenhouse since this September as a Four Season Grower. Throughout my studies I have become very interested in urban agriculture and food security and this intern position has taught me so much about the way a greenhouse functions and the processes behind a non-profit organization. I would be interested in contributing to and helping achieve the greenhouse vision to strengthen urban agriculture at Concordia University and to personally learn more about the ways in which the Board of Directors shape this organization. I feel I can contribute greatly to the Board of Directors with my current knowledge of the greenhouse, my hard work ethic, and my excellent communication skills. I’m an Environmental Geography major with an eco-friendly mindset. For me, working with the Concordia Greenhouse is a chance to share and expand on sustainable practices in an urban setting. Working as a member would be a great chance to help show communities the many possibilities for environmental responsibility within a city. Recent work included the following: Marine Conservation in Cambodia (diving, beach cleaning, coral reconstruction and data collection), Earthship Building Course in Brighton, England, WOOFing in New Zealand and India, Animal care in New Zealand, Volunteering in removed communities in Myanmar, Earthquake Relief Aid Worker in Nepal. I am in my final year at Concordia, completing a joint-specialization of English and History with a minor in professional writing. I am also currently in the process of applying to grad school to pursue a Masters in English literature. During my undergraduate studies I spent a lot of time volunteering and delving deep into the world of books and literature. I was vice president of external affairs for the Concordia Association for Students in English (CASE. )I would be a great addition to the Concordia Greenhouse Board of Directors as I am responsible, organized, a team player, perfectly bilingual (English and French), and I have experience being in positions of leadership. My most defining characteristics however, are probably my determination and high standards. I am a student pursuing a Bachelor of Commerce with a major in Management. Campus Potager has given me an opportunity to share the knowledge I have obtained from gardening, while also teaching me a great deal. As a Management student with a keen interest in agriculture, I believe that I would be an appropriate choice to sit on the Greenhouse’s board. My undergraduate studies give me a business background, and my interests, a sustainable perspective. I would like to put these two aspects to work, keeping in line with the organization’s mission and vision. My membership in the newly formed Food Hub also connects me to all sustainable food initiatives on campus, which could offer strong networking opportunities for the Greenhouse. I am presently a full-time double major Concordia University student in Geography and Community, Public Affairs, and Policy Studies. Before having switched my concentration, I spent two years in the Honours Psychology program at Concordia University. As a student of in the School of Community and Public Affairs, I am not only highly invested in issues related to policy formation, but have also both an academic and personal appreciation for the inherent value of grassroots initiatives such as the Concordia Greenhouse. I am an ASSE delegate for the School of Community and Public Affairs. Through this role, I am responsible for effectively communicating my department’s desires to the Association pour une solidarité syndicale étudiante, and vice versa. This position has offered me the opportunity to practice diplomacy, networking, as well as to observe union decision-making processes and policy formation. I am currently a student at the School of Community and Public Affairs,and I am completing my last year. What I am more appreciative to this program is the diversity of ideals and opinions people bring intothis school with them. I have been challenged by those people days after days, and this have made me grownso much. I have discovered that food injustice and sustainability issues are growing interests for me, as well as animal rights and cruelty. I have an internship planned after holidays with Santropol Roulant, and I feel I could reflect my learning with them to the greenhouse and vice versa. I love working on a team and am already ready to jump on board! I also attended Concordia University and am proud alumnus. I have a BA in Cultural Anthropology and a graduate diploma in Journalism all from Concordia. I joined Action Communiterre where as a collective we chose what to grow; we grew it using ecological practices and shared in the harvest. I have been an active member for about three years. I was also the only regular volunteer at the Concordia Seed Sharing project at the Loyola Campus all last year when we had to build the garden. I was responsible for sustaining it when the coordinator was absent for a few weeks. I also worked with Incredible Edibles on a community initiative growing organic food accessible to the public. I continued volunteering at Eco-quartier NDG throughout with the community composting and greening NDG’s city streets. Presently, I work for Lufa Farms in Montreal, the first commercial ecological greenhouse in North America. 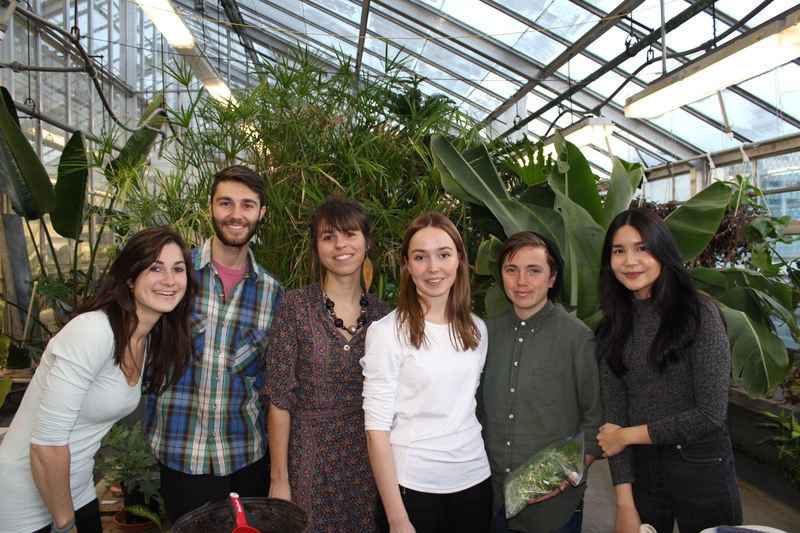 Through doing City Farm School two years ago, attending events in the greenhouse and partnering with CFS to plant garlic for the hive free lunch program, I have seen the impact of the Concordia Greenhouse on student and community life. I am invested in anti-oppression, food security and sovereignty, social justice, and food preservation and preparation. As a chef who loves to learn to grow veggies, I love and deal with all aspects of vegetables, from seed, to growth, to mouth. I am a current Concordia employee working with the people-side of significant changes, a Concordia graduate with a masters in Human Systems Intervention (the psychology and sociology of how people work together.) I am seeking to renew my membership on the Concordia Greenhouse Board. As the Treasurer for the last term, I have a good sense of how the Greenhouse works, of the challenges we face, and of some exciting opportunities we can take hold of in the upcoming year. My focus for the upcoming term would be to help the Collective develop a longer term view of how the organization is developing, and where we want to grow. Partnering with different organizations, looking at renovations and improvements to the infrastructure, and solidifying the organization are all important in service of supporting the vibrant, exciting, and community-minded organization we have built. I am currently doing a major in Community, Public Affairs and Policy and a minor in Sustainability. I volunteer for People’s Potato here at Concordia. I still go there to help in the kitchen or serving. Moreover, I attended various workshop and also did some volunteering work for the Greenhouse. I have a very strong team work skill since I take part in a lot of discussions and meetings. I believe that every person is creative and has something to bring in an organisation. I am grateful to currently work at the Co-op Burritoville. It is an honor to be surrounded by people that believes in alternatives and have the courage to challenge our current capitalist system. I believe that a horizontal way of managing builds stronger communities and develop a sense of belonging for people. It is time to change our system and build alternatives to prove that there are other ways to live in this beautiful world. I’m an undergraduate Concordia student, and I’ve been working with the Greenhouse in some capacity for the last three years, namely by being on the board for the two years. Outside of the Greenhouse, I’ve collaborated with other community-focused organizations, such as People’s Potato and the Loyola Luncheon. My studies are on applied human relations, and in community and public affairs. I wish to participate on the Greenhouse board for one more year, contributing to maintaining organizational memory and facilitating the work our Collective puts forth into efforts around urban agriculture and community. Previous PostAnnual General Meeting and Board of Directors Call Out!Next PostWe Welcome Our 2015-16 Board of Directors!